I didn’t do much of anything today. I did rent a bicycle from the condo office, though. Quite a sweet ride, wouldn’t you say? Especially the basket…I love the basket. Much easier to bring home trinkets from the souvenir shops. 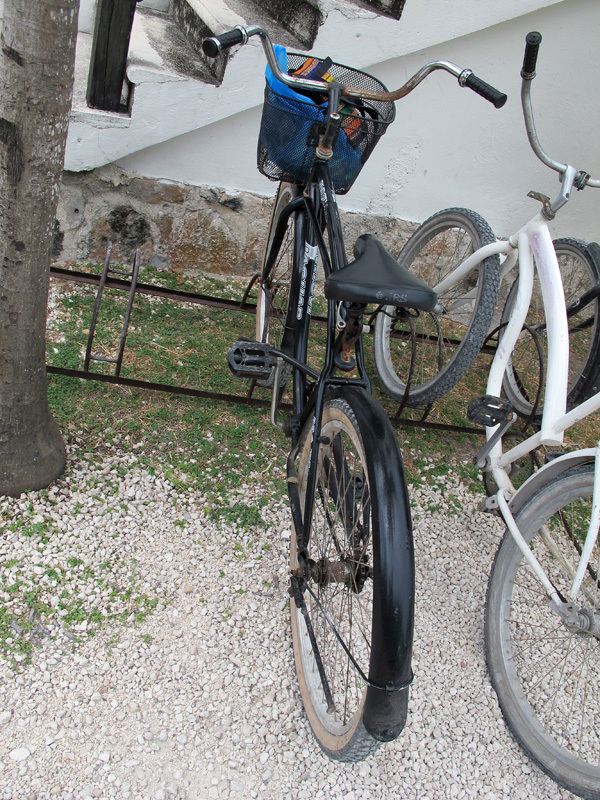 Although I have to say that after climbing Coba…and now the bicycle…my legs have had quite a workout this vacation. That’s not a bad thing, though. So I drove into town, although I didn’t really take many pictures. Did a little shopping, ate a little lunch, came back and sat out on the beach for awhile. 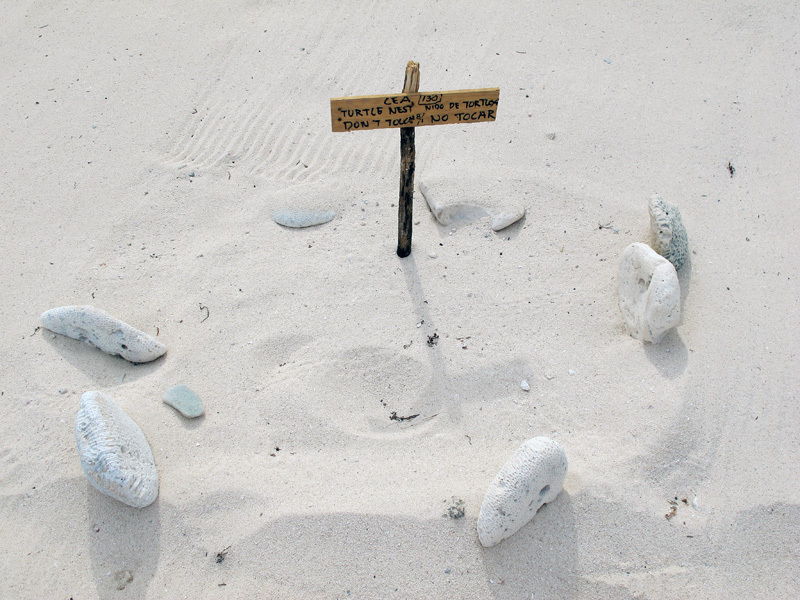 While I was sitting out there, I noticed these little areas in the sand surrounded by rocks and coral with little signs that looked like crosses. While they may look like mini grave sites, they are, in fact, the opposite. 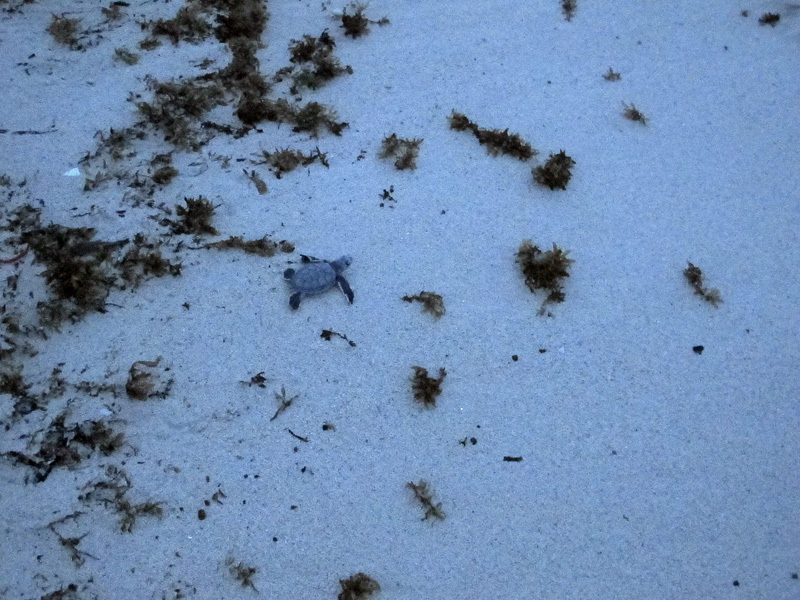 I asked someone who was passing by and these little areas note the places where mama sea turtles have laid their eggs. This person also told me that some had surfaced just a short ways down the beach. Luckily, I had my camera, so off I went. I should have taken a picture of the group of people surrounding this little scene, but I was so intent on what was happening, I didn’t think of it. 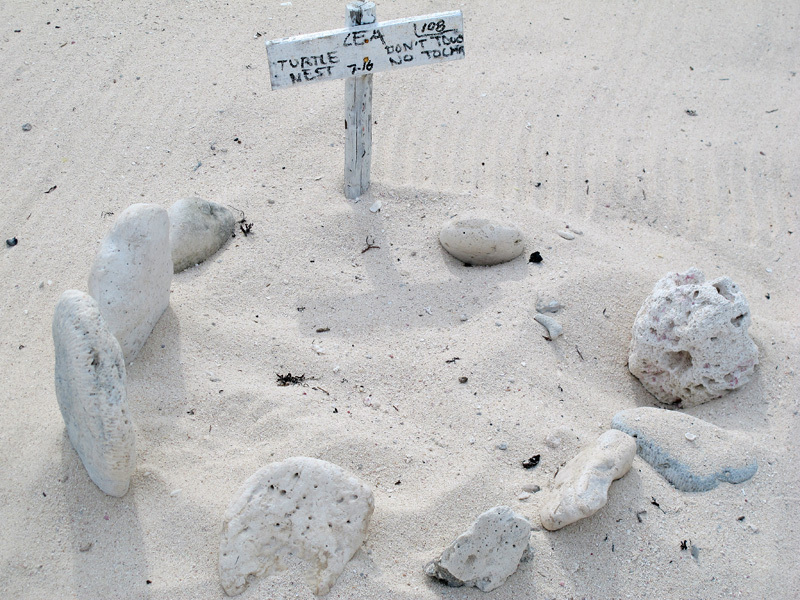 Apparently, the mother turtles come to the beach during the night and lay their eggs about a foot underneath the surface of the sand. (This is what one of the people who was in the group told me.) 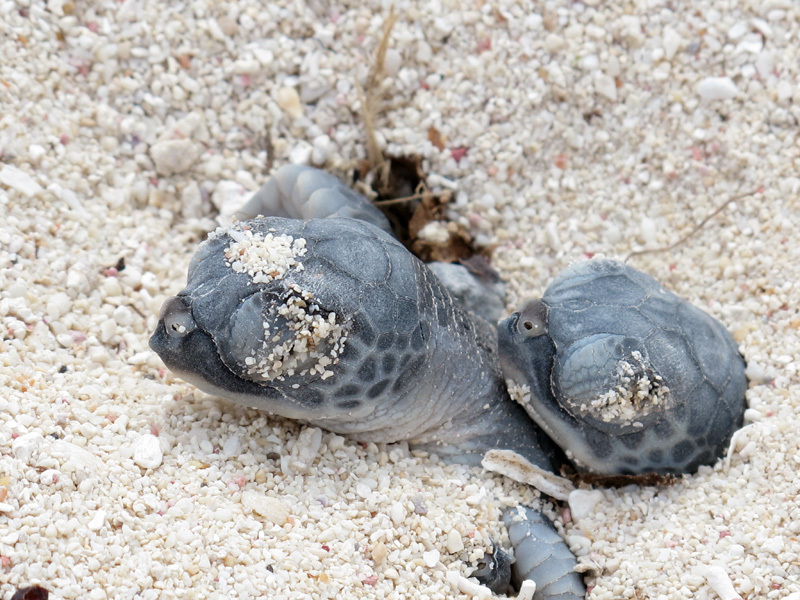 When the eggs hatch, the turtles slowly make their way to the surface. It is a very slow process and when a few turtles pop their heads through the sand, it can still be awhile before they come all the way out. The woman who seemed to be the head of the group said that they would probably be popping out at about 7:00 p.m., so I made it a point to be there by then. 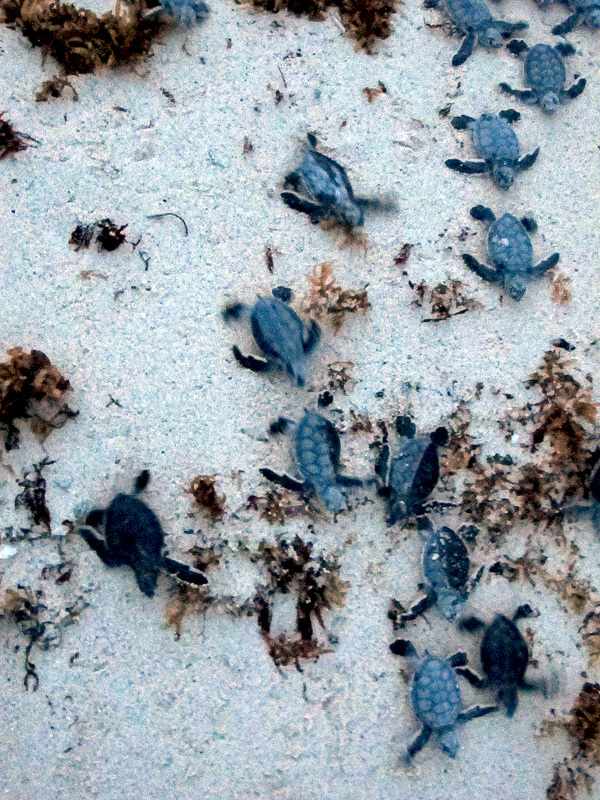 Well, these baby turtles’ schedules weren’t exactly “on time,” and we anxiously waited about 45 minutes before they made their appearance. The few that had popped their heads through were motionless for almost the entire 45 minutes that I was there. 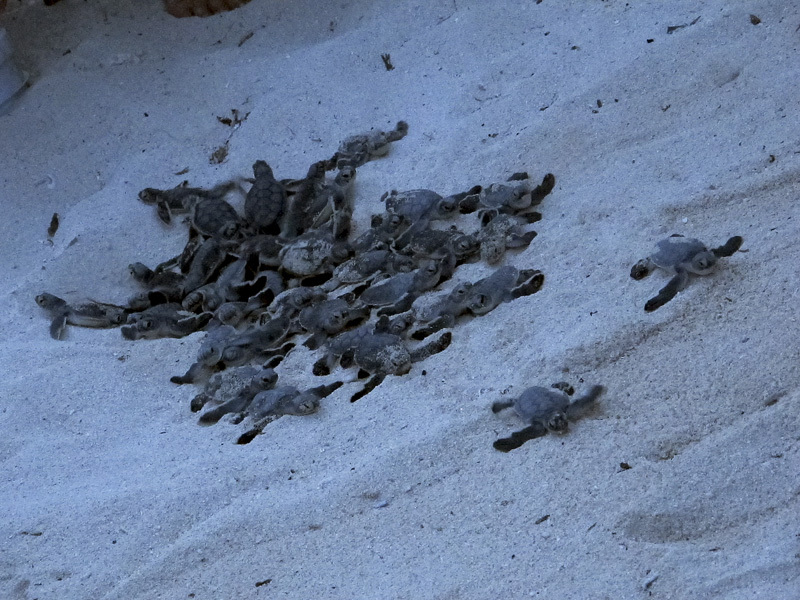 Then the one that was on top started to move his flippers. That’s all it took and then what was probably about 50 or so baby turtles poured out of that hole and headed for the sea. It was pretty amazing. 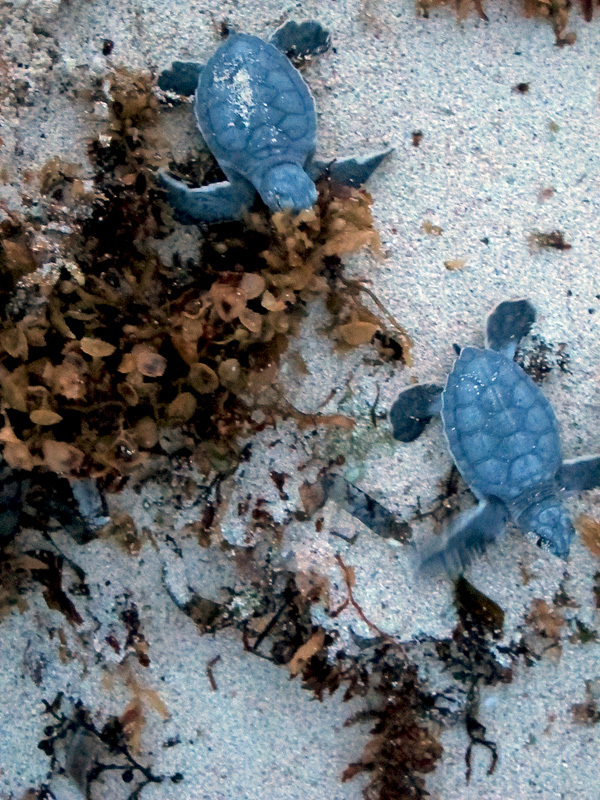 For these little guys to come to life and know exactly what they’re supposed to do is a miracle. And I couldn’t believe how fast they moved! And after about only a couple minutes, they were all gone. These little guys were only about four inches long. They can grow to over three feet and weigh about 400 pounds. I wish them well…they certainly made my day. It’s raining now. I think Hurricane Ernesto is stopping by for a visit. I have my window open and I hear the sea crashing against the shore…and the rain. Two of my favorite sounds. Life is good. This entry was posted on August 7, 2012 by EditorDeb. It was filed under Uncategorized . Very serendipitous! 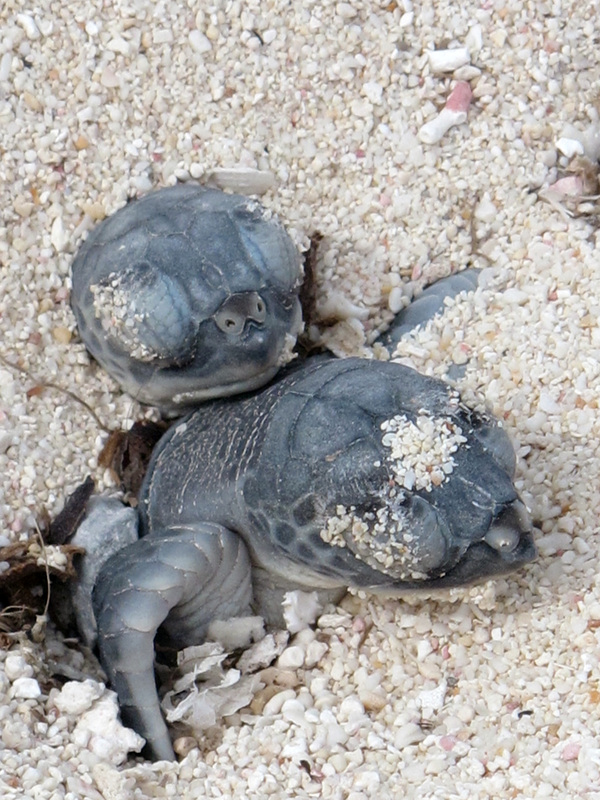 Glad you were able to see the baby turtles–Have seen photos from the releases on Isla, but never from the start like this–thanks for sharing! That is such an amazing set of pictures. I’ve heard so much about them but never seen them. Thank you, Thank you, Thank you!! 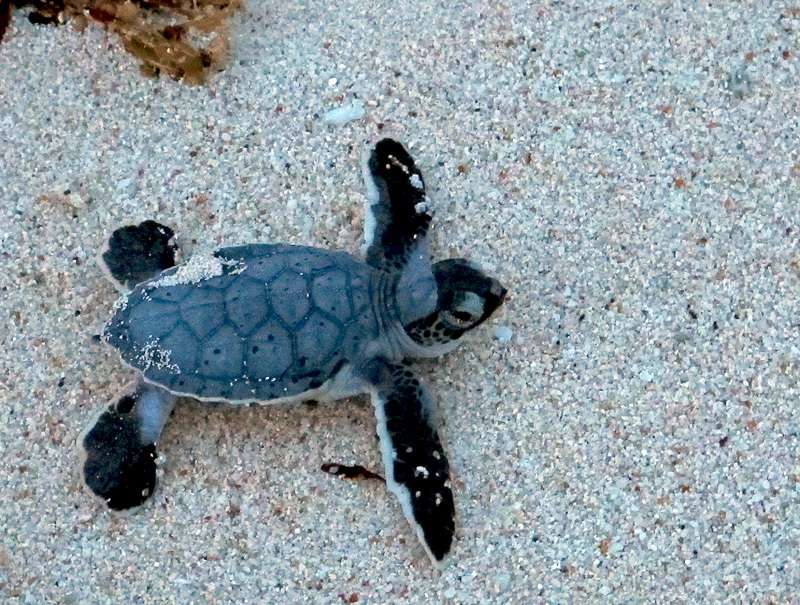 What a little miracle right there on your own stretch of beach. Deb I’ve been reading your blog(s) for awhile now, it’s been fun living life through you as you travel through Mexico. I have seen a turtle laying her eggs and a nest, but never this! Just amazing. Thank you so much for sharing such a treasure! Thanks, all. I was really fortunate to able to see this miracle. I’ll never forget it. Breaking waves and rain are also my two favorite sounds. It looks like Ernesto’s making landfall somewhere north of the Belize border around midnight tonight as a Category 1, so I’ll be looking for your storm report. Stay safe! Love the turtle pics! Beck, Ernesto has been here with us pretty much all day. An on-again/off-again rain during the day, but now it’s been pretty constant strong winds and spitting rain for the past couple hours. I don’t see it letting up anytime soon. Still have electricity and internet so far so that’s good. I had canned spaghetti for dinner from the tienda down the street. Yay.